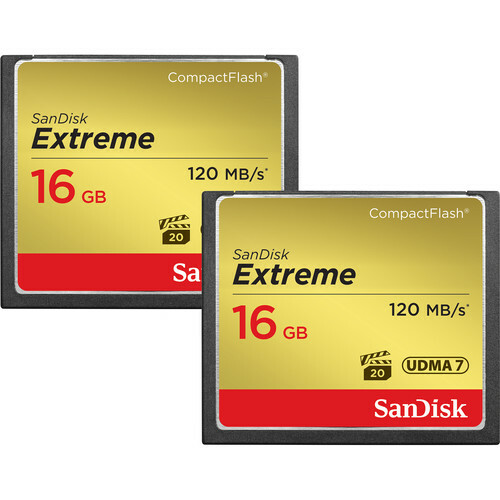 The SanDisk 16GB CompactFlash Memory Card Extreme 400x UDMA - 2-Pack is a package consisting of 2 of these high-performance CF cards. Each provides fast, reliable photo and video capture. With a speed rating of 400x, this card boasts a read / write speed of up to 60MB/s., with a lower write speed. Ultra Direct Memory Access 5 (UDMA-5) and proprietary Enhanced Super-Parallel Processing (ESP) and Power Core Controller Technology ensure class-leading performance. When paired with a UDMA-compliant DSLR camera, this card guarantees speedy, high-quality photo and video capture. Enjoy the security of a lifetime warranty.